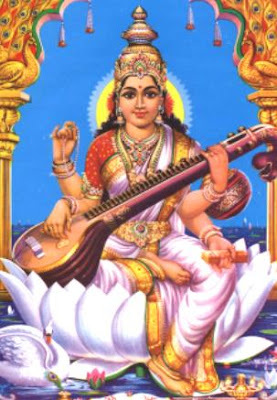 Saraswati is the Hindu goddess of knowledge, music and the arts. She is a consort (W/O.) the lord Brahma (God of Creation). With goddess Lakshmi and Parvati (Durga), she forms Tridevi. Goddess Saraswati's children are the Vedas, which are the oldest sacred texts of Hinduism. Still more about Goddess Saraswati.